Your security and your control of the horse depend greatly on having a 'good seat' while sitting in the saddle. Horseback riding is a lot like dancing, and good posture and position are essential. 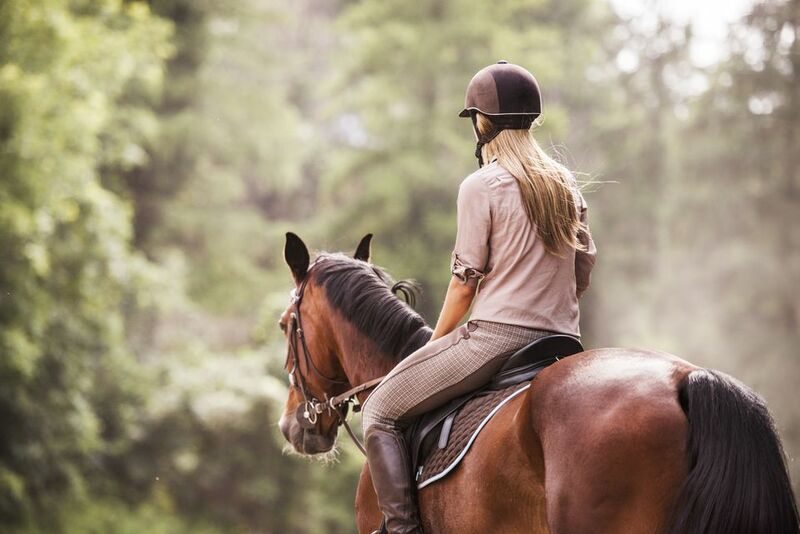 Learn how to correctly position your hands, body, and legs while horseback riding. Time Required: Plan to spend at least 30 minutes working on the correct position of your body, hands, and legs. An ASTM approved riding helmet, and safe boots or safety cages on the stirrups. Your horse, saddled and bridled. Someone to hold your horse while you get the feel of things. A safe spot in an arena or riding ring were you can concentrate. Nice to have: a mirror or video camera so you can see what you look like. A coach to correct you when you get out of position. Start SafeHave someone hold the horse so that you can concentrate on getting the correct position once you have mounted and are sitting in the saddle. Find Your BalanceSit squarely, with your seat bones comfortably in the middle of the saddle seat and your legs hanging loose on each side. Make sure you are not slouched to one side and are feeling relaxed. A Foot in Each StirrupLift up your feet and slide them into the stirrups. You can do this one at a time or at the same time if you are feeling balanced and co-coordinated. Your feet should lightly rest in the stirrups with the widest part of your foot. Your heels should be angled, but not pressed down. As you take lessons,heels down is something you`ll hear a lot of from your instructor. Check Your PositionLook down and check that you cannot see your toe or your heel. Your feet in the stirrups should be pointing in the same direction as your knee is lying, but not excessively gripping the knee roll of the saddle. Don’t let your ankles cave in, or swivel so your toes are pointing in. Holding the ReinsPick up the reins, one in each hand, or if Western riding, with both reins in one hand while the other rests along your thigh. The rein end that is attached to the horse’s bit should be coming out under your little finger, with the buckle or loose end coming out past your thumb and forefinger. Fingertip ControlHold your hands at about a 30 degree angle to the ground with your fingers closed around the rein in a relaxed fist. Holding your hand upright or too flat decreases your flexibility and strength. Some people hold the reins between the baby and ring fingers—either way is okay. Learn more about holding on to the reins correctly. Perfect PostureSit tall and relaxed with your shoulders back. Don’t stiffen your back and try not to slouch—bad posture is as much a problem when riding as when walking or running. Sit Tall in the SaddleLook up and past your horse’s ears. Looking down stiffens the spine and causes your horse to feel like he is carrying a heavier load. Practice Makes PerfectSmile, breathe and be patient as your body uses new muscles and develops awareness. Practice does make perfect, so expect to correct yourself frequently as you ride until your 'perfect seat' becomes perfectly natural. Don’t jam your feet too far into the stirrup. You should be able to take your feet out without too much struggle. Ideally, the angle made by your shin and thigh bone should be no more than 100 degrees and no less than 90 degrees. If you are nervous or tense don’t forget to breathe. Your horse will pick up any tension and be less likely to want to stand while you practice getting your position. As you hold the reins your arms will be hanging relaxed at your sides, your elbows close to, but not touching your body, and your hands slightly below your navel. Ideally, your thumbs will be about six or seven inches apart. A string attached to your earlobe would fall down the middle of your shoulder, hip, and heel. The red line on the photo shows the alignment.